Check out this great chorus! This is really simple Doom Metal, done really well. Which is not as easy as it sounds. Hoping to hear more from this Finnish band before long. “The quality of the sound in the Posthalle was immense. Loud, crisp and incredibly clear for all the bands, which created a wonderful level playing field. Rising British doomsters Age Of Taurus played one of the sets of the day. 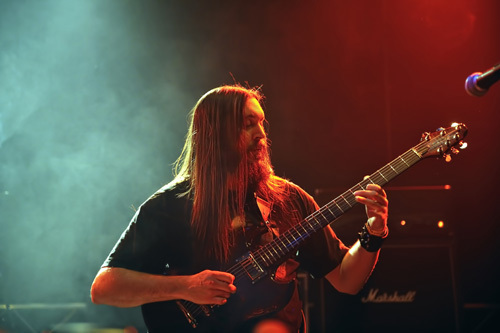 Their traditional style of riff-heavy doom threw out a crowd-pleasing noise, with both the up-tempo and slower material receiving a huge response. ‘Walk With Me, My Queen’ was a particular success – a classic in the making. “Beelzefuzz have been causing a stir in the US underground and recently released their debut album to warm reviews. Their sound is hard to pigeonhole (no bad thing), less heavy with more progressive elements, and while some of the intricacies seemed lost on the German metalheads, I found it hard to take my eyes off frontman Dana Ortt. With higher pitched Alex Lifeson-like vocals and some impressive technical wizardry on his guitar, this guy is magnetic. 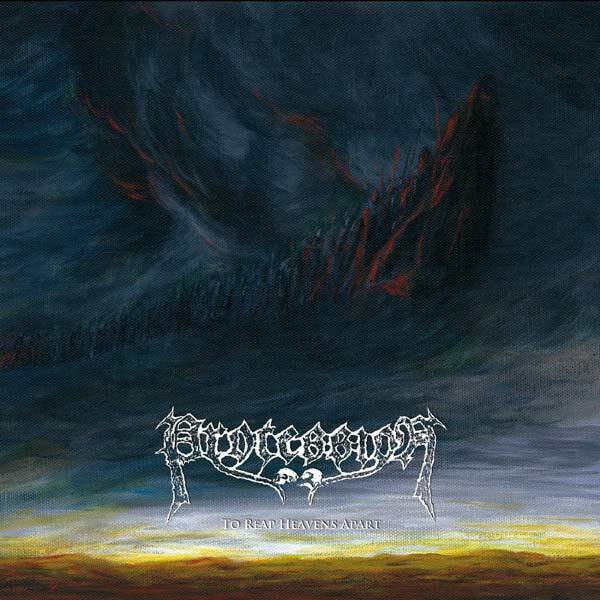 “While Year Of The Goat were a bit generic Euro-metal for me, (too much posing, not enough substance), Procession were an entirely different beast. Showing the potential to be future headliners, they were the heaviest band of the day and put in an incredibly tight performance that went down a treat. 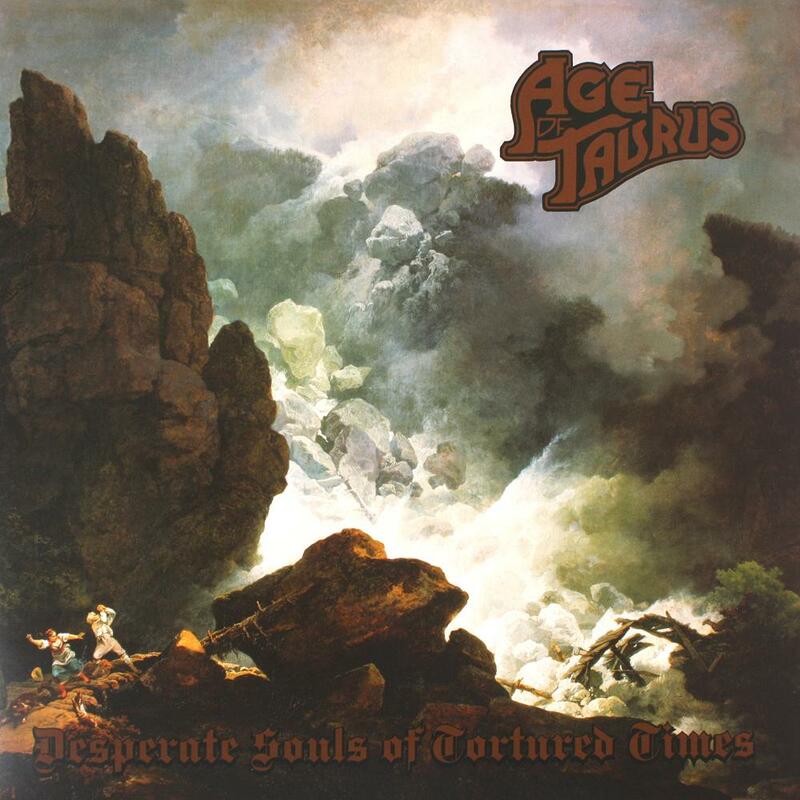 Tracks from their 2013 album ‘To Reap Heavens Apart’ received the most fervent response, but older material was also warmly welcomed. Personal highlights were the title track and ‘The Death Minstrel’. 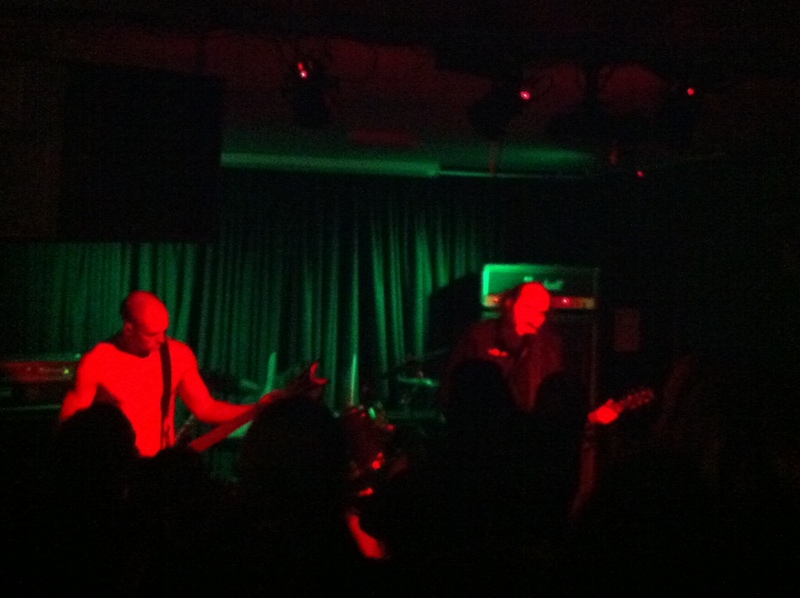 With vocals reminiscent of Primordial’s Alan Averill and many nods to great doom bands, Procession’s set was a triumph. 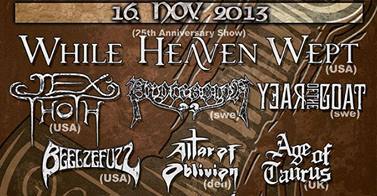 “While Heaven Wept were back at HOD for a third time, but the first as headliners. Their biggest fan-base is in Europe, so it seemed an appropriate place to celebrate their milestone. While maybe not being ‘pure doom’, there’s no question that their roots are doom and the heart of even their most recent album retains doom at its core. “In typical low-key fashion, they started with ‘Epilogue’ and ‘Sorrow Of The Angels’. Tom Phillips promised older material and more obscure tracks, and this was a perfect start. Rain Irving’s vocals give the older material another dimension, never more evident than on oldie ‘Into The Wells Of Sorrow’. This was one of the highlights, with Rain pouring his heart and soul into Tom’s lyrics. “Soon after we were treated to the full version of ‘The Furthest Shore’. The word epic is overused, but has never been more appropriate. The follow-up to ‘Fear Of Infinity’ is set to be a 40+ minute one-track epic that will re-define the definition of the word. “Then a curious moment in the guise of ‘Unplenitude’. Not the piano ballad from ‘Fear Of Infinity’, but the B-side from the band’s very first 7-inch single. And it’s very different to the one most will be familiar with, resulting in bemused looks around the Posthalle. As Tom later joked, this was the ‘dance version’! “Next we were treated to ‘The Drowning Years’, ‘OEF’, ‘Voice In The Wind’ and ‘Soulsadness’. Wow. So vibrant. Rain gave up during VITW and left the crowd to it. A perennial live favourite. “After that, a breather, and Tom made an announcement. With huge new material on the horizon, it was time for the last live performance of the band’s biggest doom classic, ‘Thus With A Kiss I Die’. This 17-minute monster never disappoints and Tom’s jazz influenced jam was as immaculate as ever. Again, Rain’s vocals gave the song a feeling way beyond the original version. One of the funeral doom ‘must-have’ releases of 2013, Lycus’s ‘Tempest’ offers enormous, bleak music straight from the black caverns of Hades, supplemented by terrifying growled vocals and soul-crushing chanting. There are occasional, frenzied black sections that bite off chunks of your flesh and leave you bloodied, as well as glorious epic bits that temporarily lift your desperate soul from the mire, but on the whole this Oakland, US band focus squarely on delivering pure misery in bucket-loads. Despite offering just three songs, ‘Tempest’ clocks in at 40 minutes or so. Throughout the album, there are numerous moments – sometimes as simple as the selection of a beautiful harmony, or a particular note, or even the spacing between notes – which suggest that this band is a cut above the rest. At other times, they play it a little safer, concentrating on building an atmosphere of desolation through some fairly generic (although admittedly effective) funeral fare. As a relatively new band, perhaps they are still unsure about how far to push their boat out, but thankfully the former instances far outweigh the latter. Lycus are at their best when they provide a flicker of light to accentuate the overwhelming darkness – such as the last two minutes of opening song ‘Coma Burn’, when a rising sense of elation provides a kind of tonic to the preceding nine minutes of woe. The same song incorporates some great violin work (movingly performed by Christa Schmidt) to add richness and depth to the music. When they follow their creative instincts, and really stretch their songwriting abilities, Lycus become a monstrous Doom Metal powerhouse. ‘Tempest’ is a thundering success, and there is undoubtedly more to come from this impressive Californian outfit. 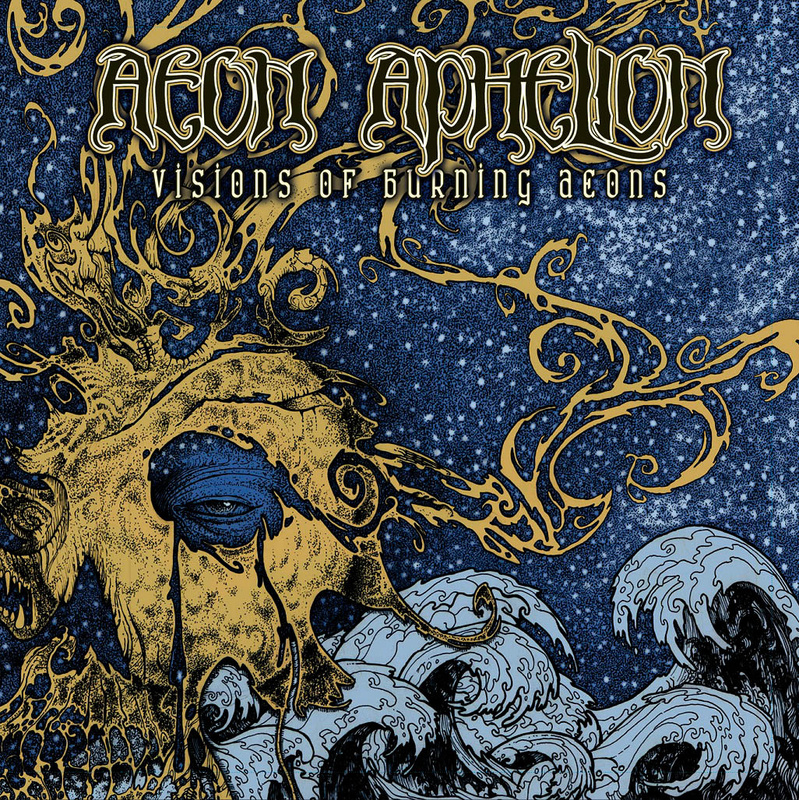 Aeon Aphelion’s debut full-length release is a classy package of seven tight, traditional Doom Metal songs. 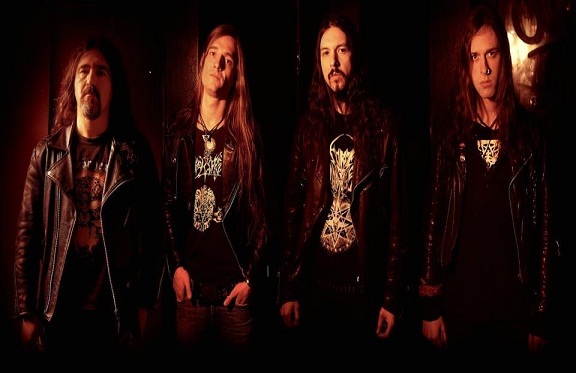 Formed in 2005, the band derives from obscure 1990’s outfit Dreamscape, but it was only in 2009, with the introduction of new guitarist Alex Koutsis (who became the singer in 2010) that Aeon Aphelion began to find their true voice. Koutsis’s vocal style is reminiscent of ‘Clouds’-era Tiamat, or Ola Persson from the now-defunct Averon, or even Cathedral’s Lee Dorrian – coarse, wheezing, depressed and yet strangely beautiful and capable of delivering a broad emotional range! Further underscoring Koutsis’s impact on the band, he also had a hand in the album’s production, which is clean and dynamic, showcasing the band’s considerable skills very effectively. Having hacked off their early death-doom roots, the Greek band’s sound is now firmly planted in the genre’s purest traditions. This is a timeless doom opus that would not feel out of place had it been unleashed in 1993 or 2013. But far from being old-fashioned or predictable, the music has great character and personality within its self-imposed confines. The riffs are fresh and original and lively song arrangements maintain your interest from start to finish. 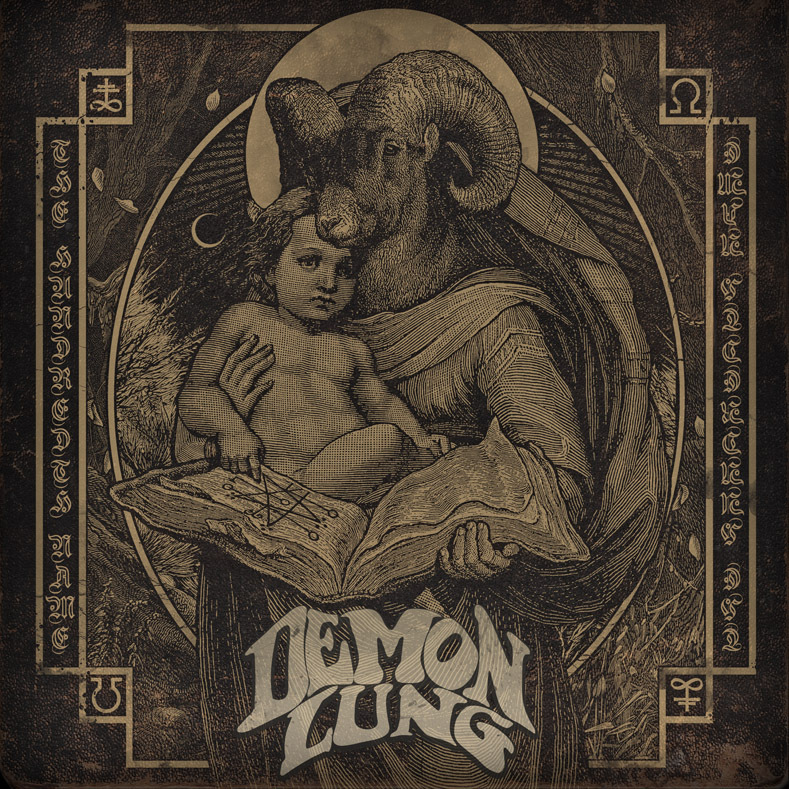 This is not the heaviest metal around, but it is slow, mean and packed with a depth of inventiveness. 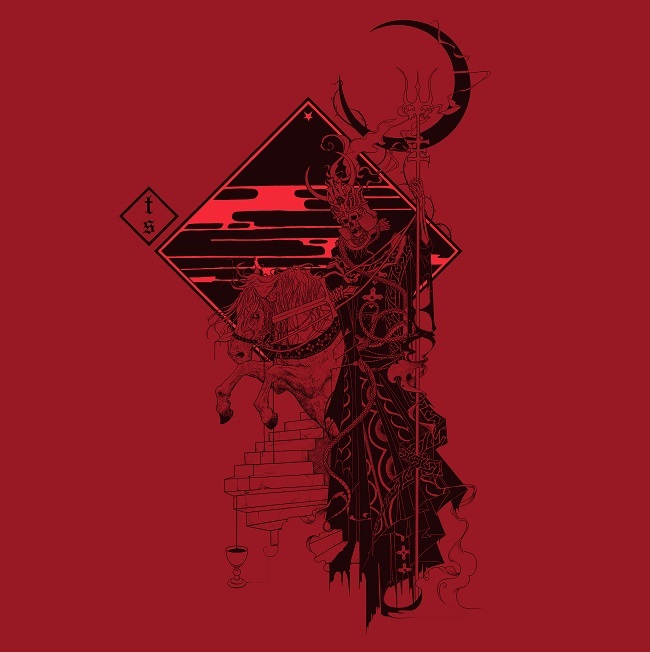 ‘Visions Of Burning Aeons’ pounds along at a muscular mid-tempo, occasionally slowing down for an introspective breather or setting off on a slightly stoner-tinged or full-on metal section that will get your feet start tapping and your head nodding. It all fits together so naturally that before you know it, you’ll be hooked. While some of the songs could benefit from a catchier chorus, or a more spectacular guitar solo to raise the hairs on your neck – like the all-too-brief solo on ‘(Dona Eis) Requiem’ – there is a wealth of really impressive stuff on offer that is revealed with repeat listens. In fact, it seems that the band have so many ideas to play with that they sometimes hurry past one or two of them instead of lingering and allowing them to develop into something even bigger and better. It has taken the Athens quartet a while to bring this album to fruition, being entirely self-financed, but it has been worth the wait and undoubtedly money very well spent. 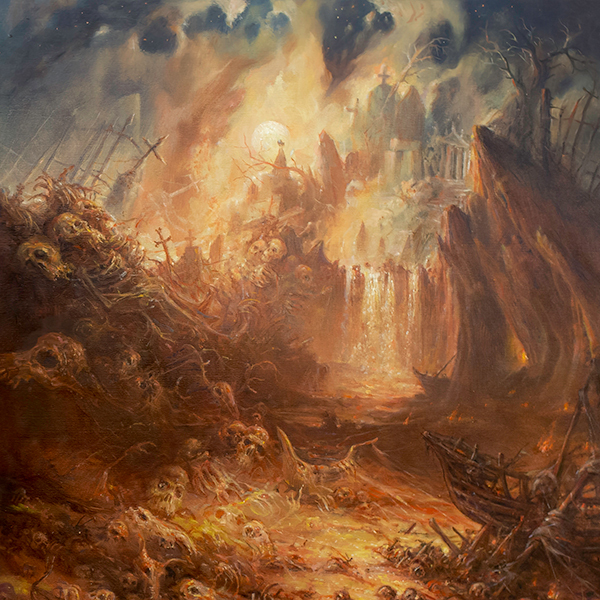 ‘Visions Of Burning Aeons’ is a consistently excellent album, a respectful and impassioned re-imagining of 1990’s Doom Metal that sounds fresh and exciting today. Best Album Cover of the Year…? 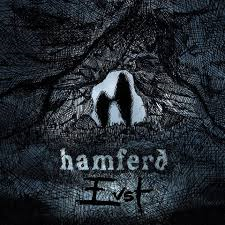 Splendid new Doom Metal from the Faroe Islands. Very emotional, very atmospheric, mixes growls/clean vocals… although for all we know they could be singing about kitchen utensils – it’s all sung in Faroese! Somehow, we doubt it. Spectacular drumming, bass lines that’ll tear your heart out and moments of grim grooviness raise this album far above the average. The slow, sludgy songs have a hypnotising quality, in the vein of Ramesses, while the crisp production (Billy Anderson, take another bow) brings out the band’s energy like never before. Tombstones’ music is not groundbreaking enough to raise the dead… but they write really good, heartfelt songs that ripple with misery. Best track: ‘Black Moon’. Classic Doom Metal band name? Check. Classic Doom Metal artwork? Yup. Classic Doom Metal song titles and lyrics? Absolutely. Classic Doom Metal production in which the vocals are slightly too loud? Another thumbs up. So is this a classic Doom Metal album??? As you know, we’re not the kind of people to get carried away, but HELL YES, THIS IS THE SEXIEST EPIC DOOM METAL ALBUM WE’VE HEARD FOR AGES! We approached this Vancouver-based band’s self-titled debut with healthy caution, having read somewhere that the vocals were not up to the job. Well, whoever wrote that steaming heap of donkey cack needs to invest in some better speakers, or perhaps some better ears! 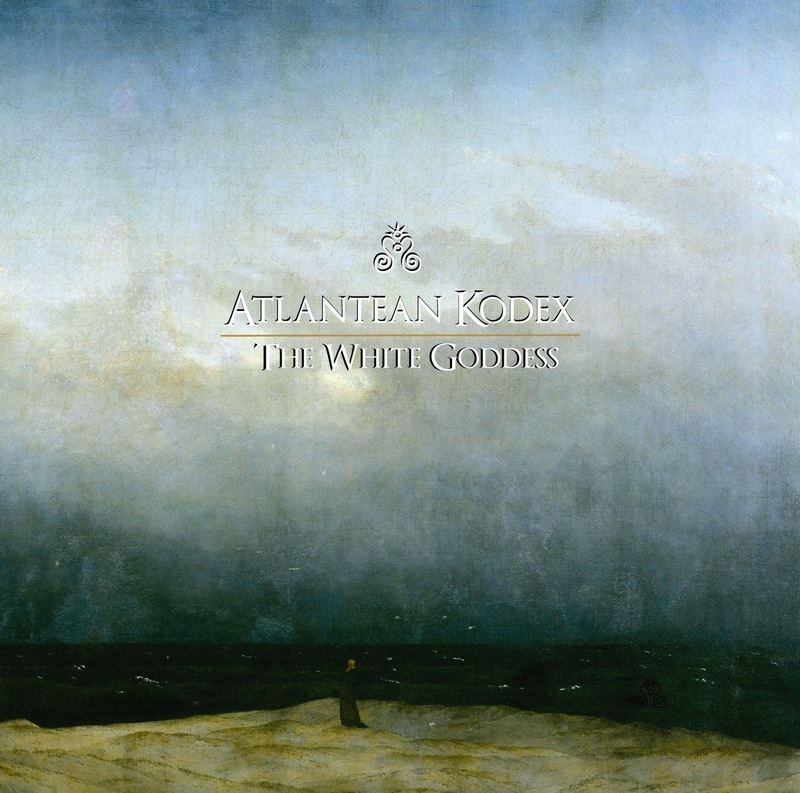 Because while the vocals of ‘Adrian M’ are prominent in the mix, it is far from being a problem because his voice has great range, depth and character, reminiscent of some legendary doom frontmen but with a flamboyantly gloomy edge of its own. In any case, the razor-sharp guitars are given plenty of opportunity to shine. And when guitarist ‘Pilgrim’ lets rip, it truly is something to behold! Some of the solos on here are so epic you want to strip naked, light some black candles and pour the hot wax all over your – no, wait, we’re getting overexcited again. Suffice to say, the guitar work is creative and deeply enjoyable. 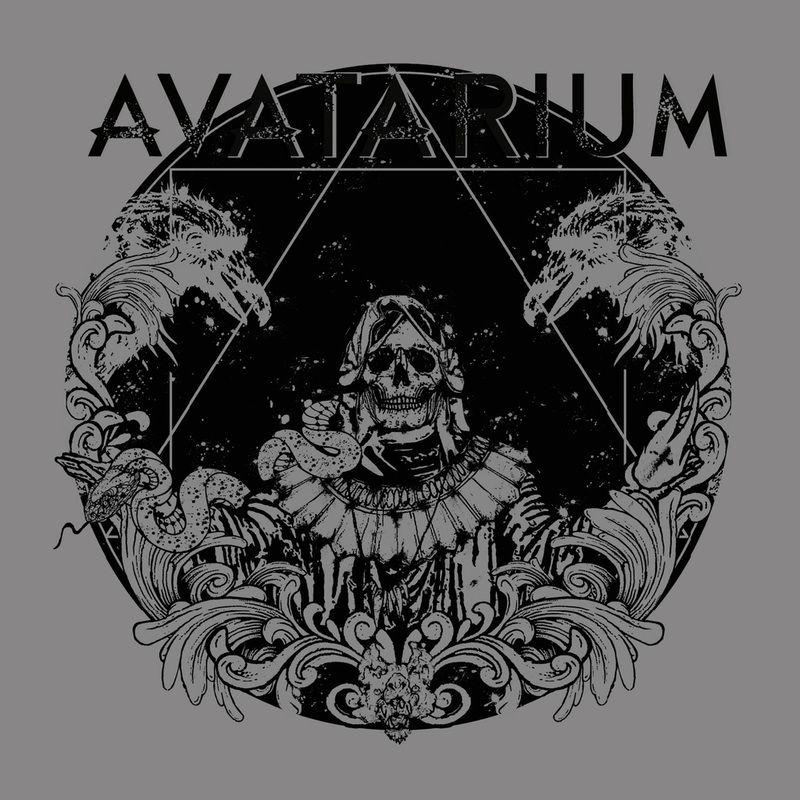 This album is highly recommended to fans of Solitude Aeturnus, Count Raven, Candlemass… and in fact, it’s recommended to anyone who loves well-written, superbly delivered epic metal that is packed with drama and feeling. Each song is tight and purposeful, and it is clear that the band has been together for a number of years. ‘Funeral Circle’ is the kind of accomplished full-length release that you might expect from a band someway down its career path. But these guys are just at the start… God knows how good they can get in the future. 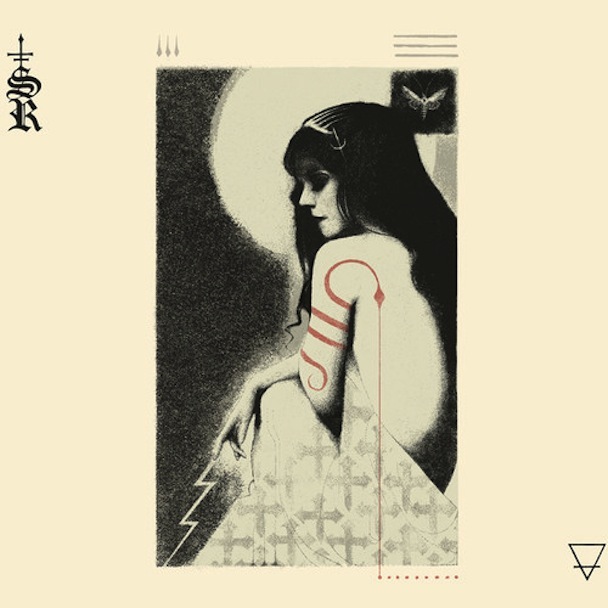 It’s not a perfect album; the bass and drums are rather anonymous and there seems to be a timing issue halfway through ‘The Charnel God’. But it’s not far off. 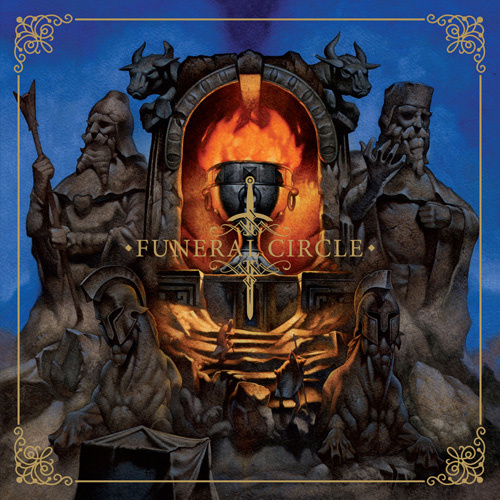 ‘Funeral Circle’ has once again renewed our faith in the fundamental truths of Doom Metal – you do not need gimmicks or glamour, just great songs, great musicians and a passion for creating a glorious, epic atmosphere. So yes, this counts as an instant classic in our eyes. 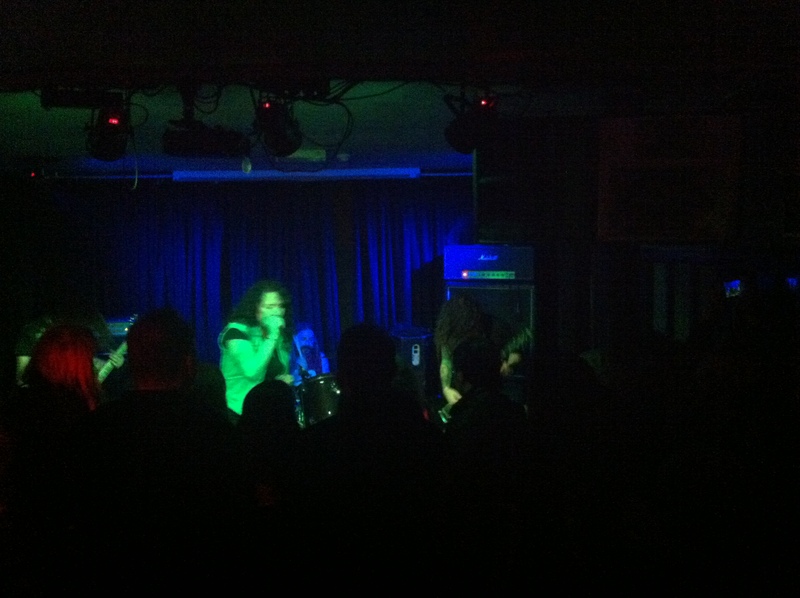 The Black Heart in London is an awesome venue – intimate, friendly and satisfyingly ‘metal’ – but it doesn’t matter who’s playing there, a bit of band/audience interaction is vital to a successful gig. Even when it comes to the world’s most miserable kind of music, Doom Metal! Sadly, neither Pilgrim nor Windhand seemed particularly interested in those of us who had ventured into the night to spend some time with them, so while their performances were musically immense, we left with a sense of mild dissatisfaction. Pilgrim were up first, and we were surprised to see a new bass player (we’re always the last to know) who looked like he was in the wrong band. He was keen to strip to the waist to show off his physique while Pilgrim’s two other (somewhat less toned) members looked on with mild awkwardness. Surely Doom Metal is more about self-loathing than self-loving? This new chap also sported a flying-V-style bass – a questionable addition to the band to say the least. That said, he and they battered out their muscular tunes with power and precision, particularly the crowd-pleasing ‘Astaroth’ which got everyone into a gentle froth. Amazing song. Some uncertain joke about British TV aside, frontman The Wizard (vocals and guitar) could barely muster sufficient energy to say hello between songs. They’d already played a few shows around Europe, and to be honest seemed a little jaded. The same could be said of Windhand, whose singer Dorthia Cottrell spent most of the evening with her back to us. It was quite strange. Maybe it was something we said. Maybe that’s her ‘thing’ and we should have known? Whatever, it was tedious. More of a problem, however, was that we could not hear either of the singers in all their glory. While The Wizard complained about sound problems a few times, Cottrell was often drowned out by the swirling doom madness that her cohorts were bent on creating. A shame, as we had been looking forward to hearing their interesting and distinctive voices.